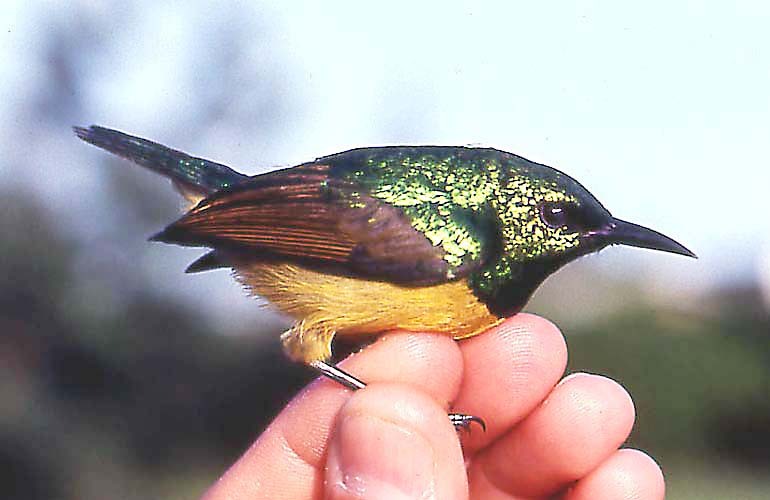 Male collared sunbird (Anthreptes collaris), possibly a maturing specimen. 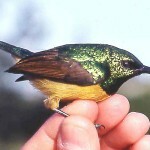 This small sunbird is found from West Africa and across to the south east of the continent. It feeds mostly on small invertebrates, its relatively short bill being unsuited to probing flowers for nectar. Ibadan, May 1964. 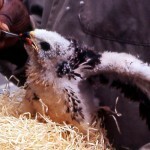 Young black sparrowhawk (Accipiter melanoleucas temminckii) being hand fed at the Zoological Garden. 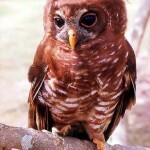 This subspecies occurs in forests from Senegal east to the Central African Rebublic. 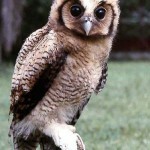 It nests in tall trees and feeds mostly on birds. The female sparrowhawk is larger than the male. 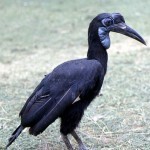 The bird shown above originated in the Ibadan area and was brought by a hunter to the Zoo where it was raised successfully. 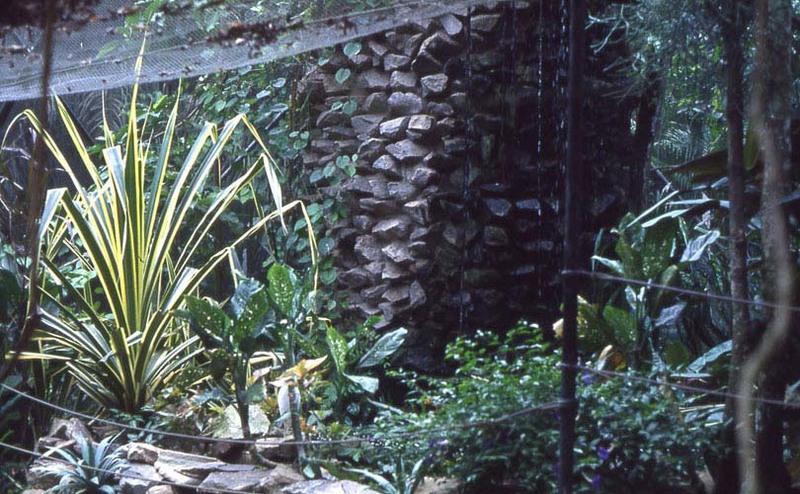 Zoological Garden, June 1964. 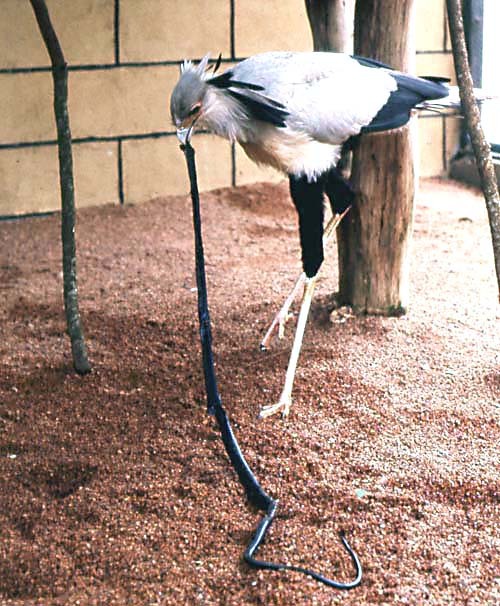 The secretary bird (Sagittarius serpentarius) is found in open, grassy country over much of Africa south of the Sahara. It stands around 3 feet high. It feeds on locusts, scorpions, rodents, snakes etc. 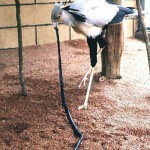 This bird has been fed a dead boomslang. 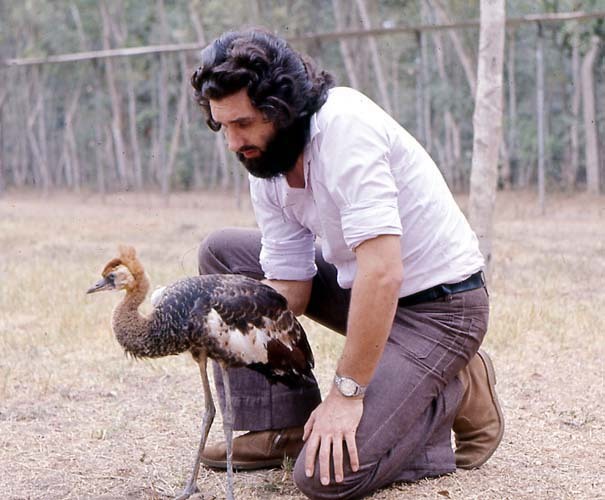 Zoological Garden, 1968. 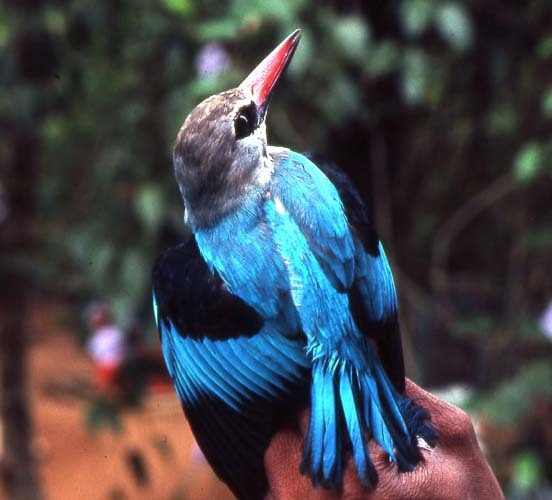 The Senegal kingfisher (Halcyon senegalensis) is widely distributed in Africa, although several subspecies have been named. 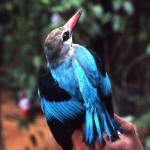 Its bi-coloured bill distinguishes it from nearly all other kingfishers. It rarely eats fish and is not dependent on water for its food, feeding on a variety of terrestrial invertebrates. Ibadan, 1968. 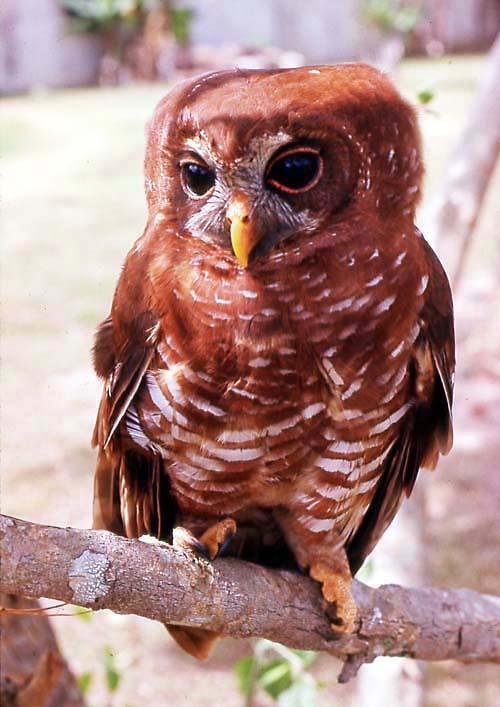 The African wood owl (Strix woodfordii) is found in woodland over much of Africa south of the sahel. Several subspecies have been described. 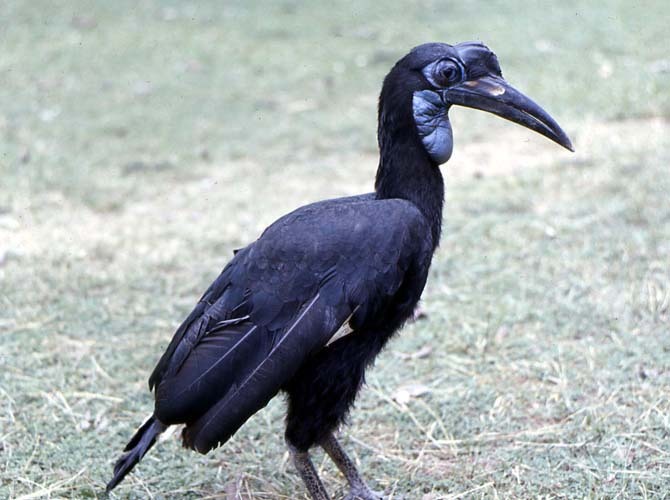 The bird pictured here originated in the Ibadan area, Nigeria. 1964. 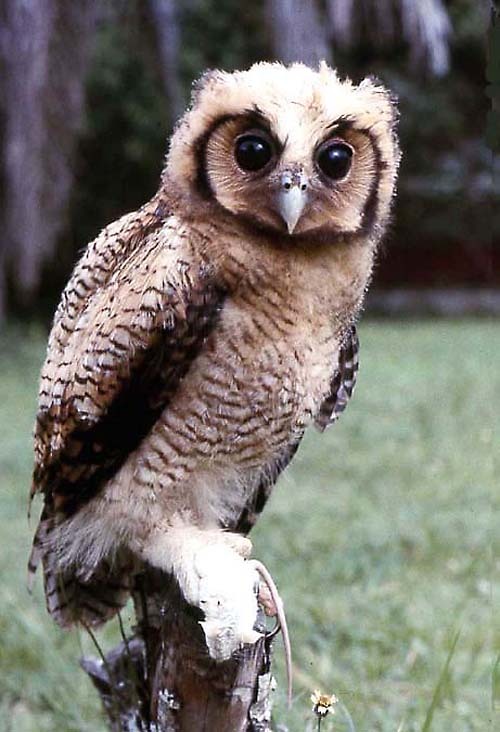 This immature Fraser's eagle owl (Bubo poensis) originated in the Ibadan area, but the species is distributed through much of West and Central Africa. 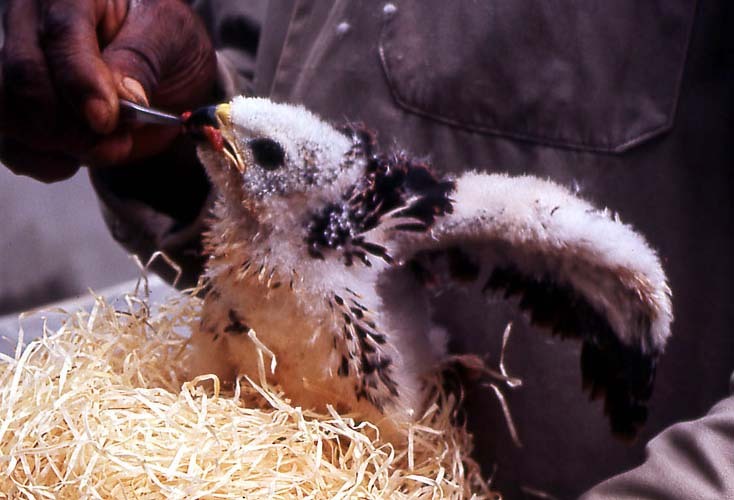 This bird is clasping a young laboratory rat. Zoological Garden, 1966. 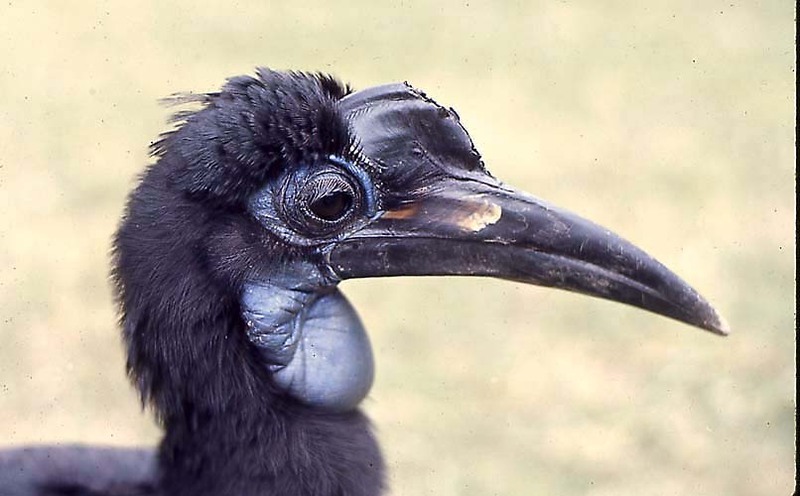 Abyssinian or northern ground hornbill (Bucorvus abyssinicus). 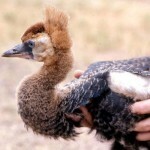 This female was brought to the Zoo, having previously been kept in close proximity to humans somewhere in northern Nigeria; its precise area of origin was unknown. This species is found in orchard bush and grass woodland and is distributed north of the Equator from West Africa east and south to Uganda. 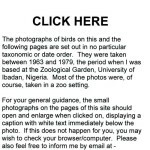 Zoological Garden, May 1966. 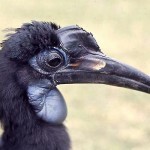 On arrival at the Zoo, the hornbill had had some flight feathers trimmed so that it could not fly well. We allowed it to roam around the Zoo grounds where it made friends with visitors and seemed very content. 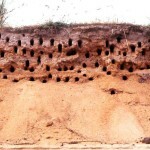 Note the prominent eyelashes which protect the eyes from dust. 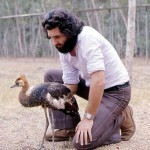 These birds eat a wide variety of invertebrates and vertebrates as well as some plant material. Wandering around the Zoo grounds, this hornbill found or captured much of its own food. Zoological Garden, May 1966. With me here is a juvenile West African black crowned crane (Balearica pavonina pavonina). I regret that my records do not give the above location (but certainly in Nigeria) or the crane's origin (certainly Nigeria or adjacent country). 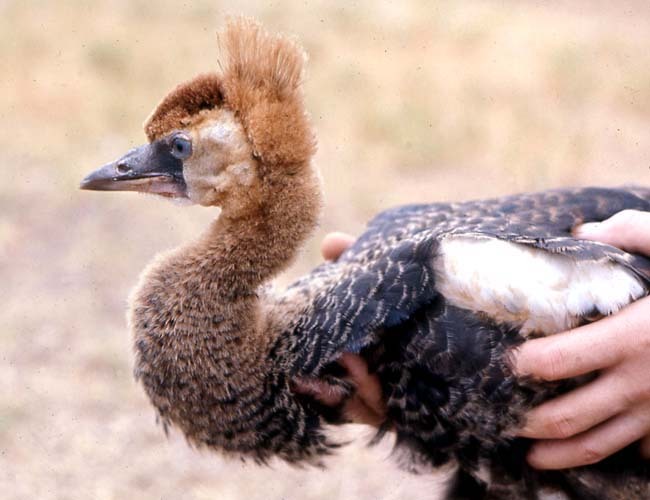 In the 1950s, Bannerman described this crane as 'more numerous' in the Northern Territories of Nigeria & 'common in places'. A 2004 survey gave the population for Nigeria as 20. 1973. Same juvenile crowned crane as previous picture. This subspecies is confined to West Africa south of the Sahara, from Senegal to Chad, where it is found in dry grasslands. 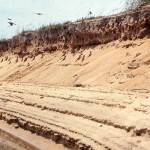 However, it nests in marshy areas where it builds a bulky nest of vegetation on the ground. Its declining numbers are due largely to habitat loss and it is listed by IUCN as vulnerable. The crowned crane feeds on grasses and a wide range of small animals. 1973. 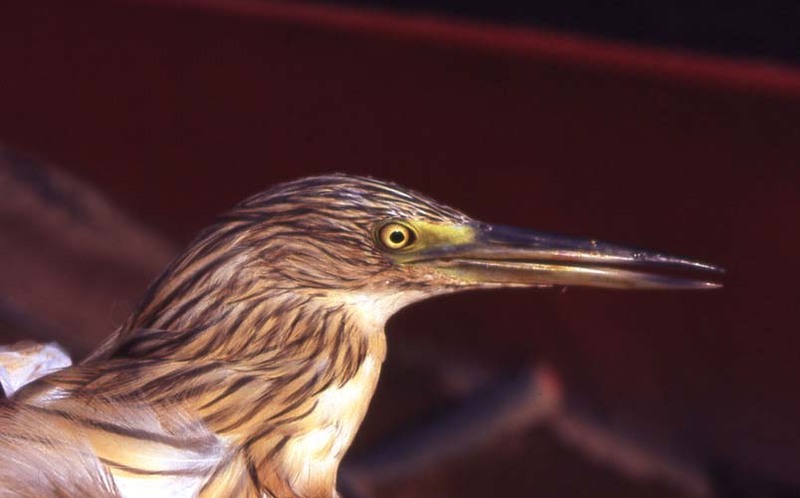 Tiger bittern (Tigriornis leucolopha). Found around rivers and streams in forested country of western Africa. 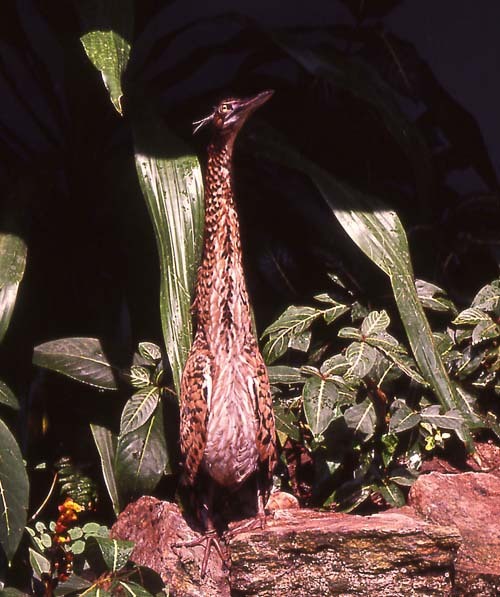 As in this picture, this bird can assume a rigid, erect position so that it is difficult to see among vegetation. 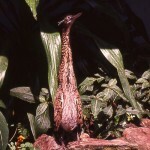 Zoological Garden, November 1964. 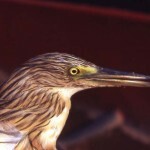 Squacco heron (Ardeola ralloides). Found over much of Nigeria, but its wider distribution includes parts of Europe, Asia and Africa. It feeds on insects such as dragonflies and butterflies as well as aquatic animals such as crabs, molluscs and fish. The area of origin of this specimen was unknown. 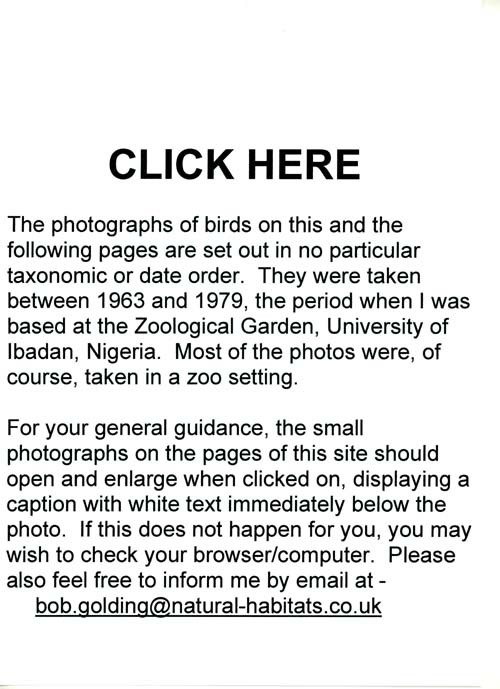 Zoological Garden, University of Ibadan, December 1963. 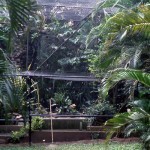 As the bird collection in the Zoological Garden gradually increased, I decided to construct an aviary large enough to accommodate several selected species within the same space. This project went ahead in 1969. 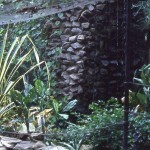 We planted many trees and shrubs, both within and immediately outside the aviary, and inside constructed a natural stone tower and pool with a waterfall. 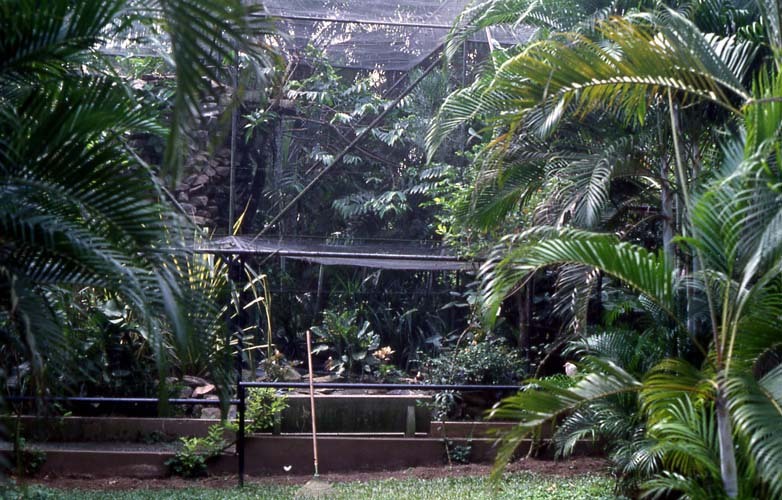 Visitors could enter the aviary, where only a low barrier separated them from the birds' flight area. 1969. 1. 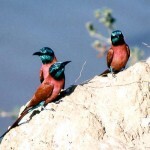 This is the first of a sequence of five images depicting the northern carmine bee-eater (Merops nubicus). 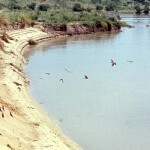 The location here is Foge Island, in the River Niger in western Nigeria, shortly before the island was submerged by the construction of the Kainji Dam and the creation of Kainji Lake. May 1968. 2. 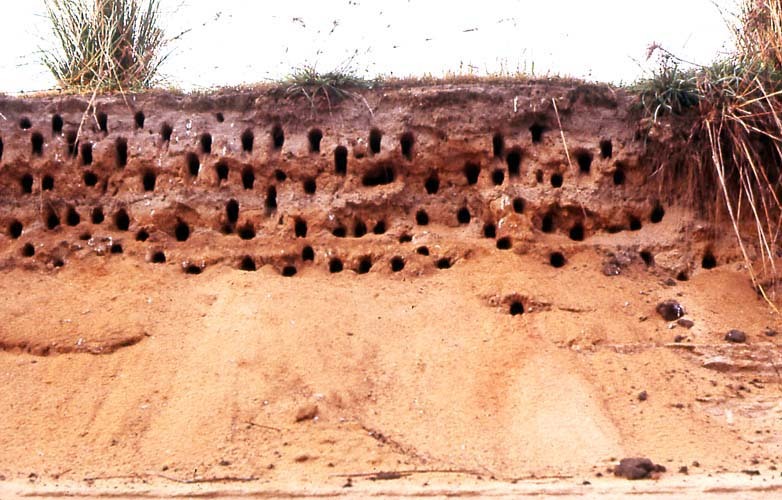 Showing some nesting holes of the northern carmine bee-eaters. 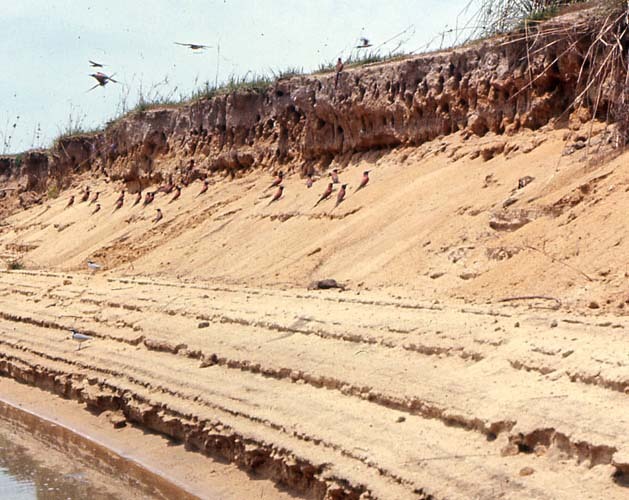 Foge Island, River Niger, May 1968. 3. 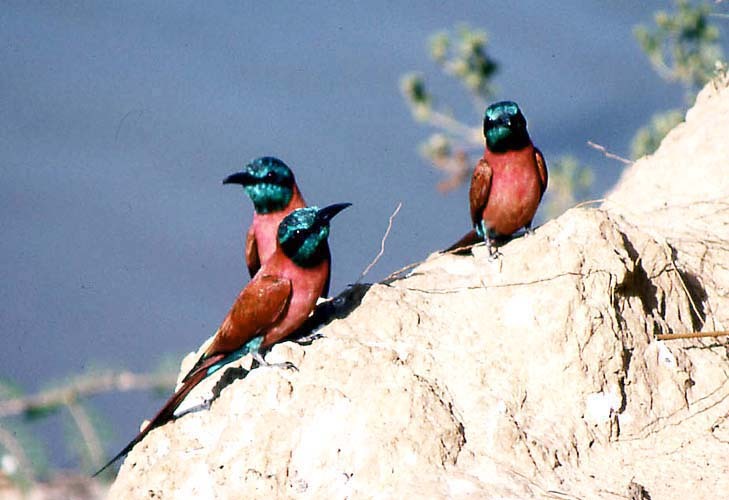 The adult carmine bee-eaters alight on the bank with food for their young before entering their respective nesting holes; they consume very large numbers of insects. 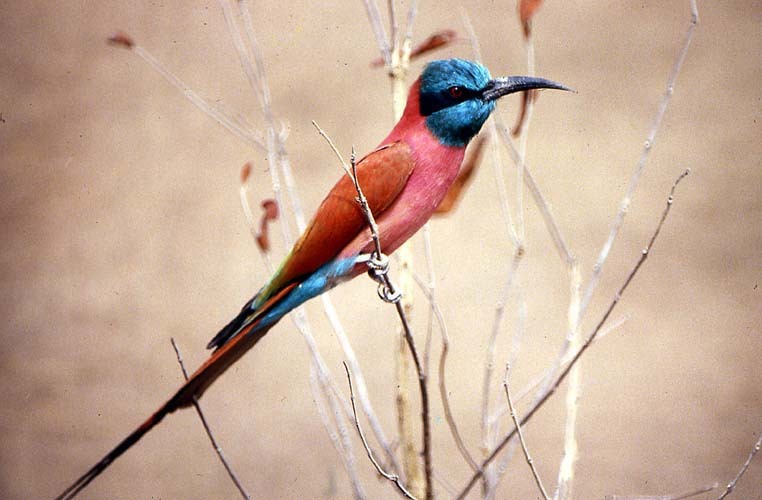 This bee-eater breeds in the dry belt from Senegal in the west to Somalia in the east but then migrates southward. 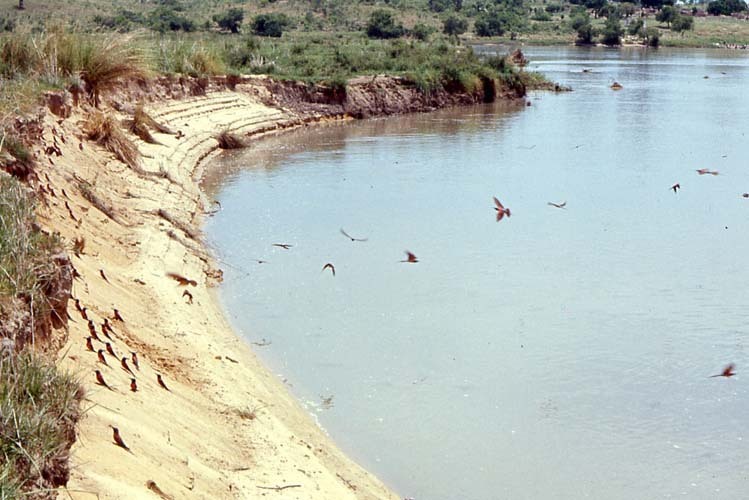 Foge Island, River Niger, May 1968. 4. 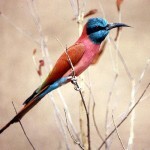 Northern carmine bee-eater (Merops nubicus). Photo by Dr Roger Wilkinson - my thanks to him for agreeing to my use of it here.